Nearly half of the funding for the City of Muscatine comes from property taxes (48 percent in Fiscal Year 2017-2018) but the fluctuations in state and federal funding sources and the highly competitive nature of seeking outside funding sources has placed even more emphasis on the use of property taxes as the major funding source for General Fund programs. The City, through sound fiscal management, successful grant applications, contributions to programs, and outside funding sources, has been able to maintain the same tax rate ($15.67209 per $1,000 of valuation) for the past seven years while also improving the services offered to Muscatine citizens. In fact, the City tax rate has not been raised for the past 10 years. But there is fear of the unknown when it comes to future funding opportunities The potential loss or reduction of back-fill payments from the state and the availability of grants and other outside funding sources could have a significant impact on what the FY 2019/2020 budget for the City of Muscatine is and how it will affect the City’s portion of the property tax rate. Departmental budgets are prepared with an emphasis on meeting the needs of Muscatine citizens whether in infrastructure, housing, safety, recreation, or waste management, to name a few. Budget planning requires the departments to not only think short term (the requirements of the next fiscal year) but also long term (future goals and objectives). The question budget planners must ask is what needs must be met in the next fiscal year and what can be planned for and implemented in future fiscal years. Those preparing the department budgets cannot live in the land where future money is guaranteed and their dreams, and the wishes of the residents, are but a yes vote away. Budget planners have to live in the land where there is an anticipation of the availability of funds but no guarantee. City department heads, under the direction of the city administrator, began to collect information on department needs for FY2019-2020 at the end of October. Preliminary budgets were prepared during November departmental meetings and lobbied in front of the city administrator and finance director during December. While many good arguments were made for the preliminary budgets during these discussions, none escaped feedback needed for the next step … preparing the budget for presentation to the City Council. One of the primary functions of the City Administrator is to weigh all of the departmental requests and then come up with something that works within the funding or proposed funding that exists. Fiscal authority, however, resides with the City Council who has the authority to allocate and appropriate of all funds. There is no guarantee that the department’s budget request will be approved without debate or without cuts, and, in fact, that debate on the needs of the department in relation to the needs of the citizens and availability of funds, is a vital part of the budget discussions by Council. There are a myriad of issues and challenges associated with preparing a departmental budget, just as there are in combining those budget proposals into one comprehensive city budget that meets the needs of the citizens of Muscatine. It is no small feat especially when you consider future money is never guaranteed, just anticipated. While local government cannot control what happens with the state legislature in Des Moines, local government can look ahead towards what they can do to ensure the expectations of its citizens are met. Long range plans that are geared toward increasing the population of residents, homes, and businesses have their base in these budgets. City departments, then, have to forecast what they can do to reach the long term goals while meeting the needs of citizens in the short term … and staying within the confines of the anticipated dollars that the City will receive in the coming fiscal year. The presentations before the Muscatine City Council begins at 5:30 p.m. on Thursday, January 24, 2019, when an overview of the proposed budget is presented. Over the course of the following two weeks, Council members will hear from the various departments and agencies as they present their FY2019-2020 budgets. While the presentations are open to the public only the Council members are allowed to ask questions of the representatives. Public comment on the budget proposals will come during a public hearing tentatively scheduled for March 7, 2019. The budget presentations will be held in the lower level conference room at City Hall, 215 Sycamore. A complete schedule for the presentations is available on the city website at BUDGET PRESENTATIONS. Each session has different departments presenting with citizens welcomed at all of the presentations. Public comment at this time is not part of the process but DO take notes because time for citizen input has been set aside during the Public Hearing that is tentatively scheduled for Thursday, March 1 (the actual date and time will be set by City Council at the conclusion of the department/agency presentations). Throughout the budget process there are numerous opportunities to participate and engage with your City staff and Council members. Please stay tuned for periodic updates on the process, issues and challenges the City faces in putting together a budget for a full service city, and a budget that meets our community needs but is also responsible at the same time. The City of Muscatine values constructive input and appreciates hearing your ideas. You can comment here on our blog, visit the Community Voice section of our web site, visit our social media sites at Facebook, Twitter, or Instagram, or you can email us to stay connected. A Snow Emergency, short for “emergency snow removal operation”, is nothing more than the enforcement of an established plan for on-street parking that allows the Department of Public Works (DPW) the ability to quickly and safely remove snow from Muscatine streets, alleys, and city owned parking lots. The on-street parking plan works to increase the efficiency of snow removal operations by limiting on-street parking even if a snow emergency is not declared. In fact, the City urges residents to remember and utilize the on-street parking plan for any snow event of two inches or more. The ability to clear city streets, curb to curb, and alleys in a timely, efficient manner benefits residents who need on-street parking and the City who can move on to other projects once the snow removal has concluded. Adhering to the parking plan can reduce the frustration of vehicle owners who often find their vehicles surrounded by snow piles and reduce the difficulties faced by snowplow drivers who must be aware of parked vehicles while clearing the streets. So when is a snow emergency declared? A Snow Emergency is declared when anticipated snowfall and other weather conditions are expected to significantly impact public safety. Representatives from City administration, the Department of Public Works, Muscatine Fire Department, and Muscatine Police Department monitor the forecast, determine resources needed for the weather event, and begin to stage those resources for snow removal operations. These representatives continue to meet as the storm approaches to determine the impact to public safety and to the safety of City workers. A Snow Emergency is usually declared before the first snowflake falls when the anticipated weather and road conditions warrant. Every storm is different, however, and not all winter storms warrant the declaration of a snow emergency. The form and amount of precipitation, the duration of the event, and other weather related factors are used to determine the response to a particular winter storm. Discussions on the most recent winter storm (code named Bruce by the Weather Channel) began before the Thanksgiving holiday when the National Weather Service (NWS) issued a Winter Storm Watch. The NWS was fairly certain that the storm was going to affect the southeastern portion of Iowa but the path and amount of snowfall changed daily. A Winter Storm Warning was issued days before the storm impacted the area. That changed midway through the weekend when the computer models fine-tuned the path of the storm and increased the potential snowfall to 8-12+ inches. An additional twist was the issuance of a blizzard warning by the NWS with winds expected to top out at 45 mph. With many communities in the region declaring snow emergencies ahead of the storm’s impact, Muscatine officials began communicating early Sunday morning and agreed that the expected weather conditions warranted a declaration. The minimum amount of time between the declaration of a snow emergency and the beginning of enforcement is four hours according to City code. And if that declaration is made after 8 p.m., enforcement cannot begin until after 8 a.m. the following day. So what is this on-street parking plan? A Snow Emergency declaration brings the enforcement arm of the on-street parking plan into effect (ticketing and towing of vehicles) and specifies what streets are cleared first. The declaration lasts a minimum of 48 hours but can be amended if road and weather conditions warrant. The City has five emergency snow plow routes which include snow ordinance routes, hospital access streets, school access routes, and transit emergency bus routes. These routes are cleared from curb to curb before the City proceeds to other streets. During a snow emergency, on-street parking is not permitted on either side of one of these routes until the streets are cleared. A color coded map of these routes is available on the City of Muscatine web site. According to City Code, streets that normally allow parking on both sides of the street will be subject to “alternate side of the street” parking during a snow emergency and this is the recommended parking plan during non-snow emergency events as well. The parking plan states that, on odd-numbered days of the month, parking is permitted only on the odd-numbered side of the street. Likewise, parking is permitted only on the even-numbered side of the street on even-numbered days. There are two provisions for all streets where parking is allowed only on one side. If that side is on the even-numbered side, street parking is allowed only on even-numbered days with no parking allowed on odd-numbered days. Likewise, if the one side is on the odd-numbered side of the street, parking is allowed only on odd-numbered days with no parking allowed on even-numbered days. The grace period (or transition time) for moving a vehicle between the first and second snow emergency day (and subsequent days as needed) is 12 a.m. to 8 a.m. For example, if the day was Nov. 28 and you were parked on the even side, you have until 8 a.m. on Nov. 29 to move your vehicle to the odd numbered side of the street. No tickets will be issued during the grace period. Just because the snow emergency is over does not mean you can leave these vehicle on the street without moving them. Muscatine Police will continue to ticket and tow vehicles that have not moved since the snow storm until the streets are clear. Muscatine Police Chief Brett Talkington reminds residents that the city parking ordinance states you MUST move your vehicles every 24 hours at least 25 feet. While the City works to clear streets, alleys, and parking lots of snow and ice, it is the responsibility of property owners to clear their sidewalks. The benefits of clearing sidewalks include reducing the potential for pedestrian falls while traversing the property, and clearing a safe path for public safety personnel if they are needed at the property. Section 3-1-4 of the Muscatine City Code states that property owners are responsible for clearing natural accumulations of snow and ice from the sidewalks within 24 hours after the last snowfall. If the property owner does not clear the sidewalk in a reasonable time, the City will attempt to notify the property owner to remove the snow and ice. If the City clears the snow and ice, the property owner will be assessed the costs of removal. Another section of the City code (Section 3-1-7) simply states that it is unlawful to throw, push or place any ice or snow from private property, sidewalks or driveways onto the streets. What Happens When the Mississippi Floods in Muscatine? Muscatine has seen its fair share of floods over the years. Because our city is nestled along the banks of the Mississippi River, we are bound to see occasional high water. Many of you may remember the record floods of 1993 and 2008. Floods like those don’t happen often, but when they do, we must have a plan in place to keep our community safe and secure. We are reaching the end of the normal flood season for the Mississippi at this point in the year, but we still wanted to give our readers a brief overview of how the City responds to floods. The City of Muscatine has an efficient plan in place to monitor river levels and then respond at the necessary flood stages. The following departments are directly involved in flood control: Public Works – Engineering and Street Maintenance Divisions, Water Pollution Control Plant and Sewer Maintenance Division, Parks and Recreation, Police Department, Fire Department, and Finance Department. Here’s a brief overview of what happens once the 16′ Flood Level is met. These guidelines were created prior to the reconstruction and raising of Mississippi Drive but are guidelines still adhered to by the City of Muscatine. 16′ is the Official Flood Level – It is monitored on the Muscatine gauge, which is located at the Municipal Power Plant, River Mile 453.0. Once the flood waters reach this level, City staff will monitor the weather and projections for river stages along with Mad Creek’s potential flows. 17′ Gauge – Wait and watch. Water will encroach upon the walk area at Pearl City Station at 17.5′. Toe drain pumps will get ready to run when necessary. 18′ to 19′ Gauge – Once a prediction of 18′ is determined, 2,000 sandbags are created, and preparations are made to phase all parking in the riverfront parking lot with detours are set up. At 18.2′ water starts to back out of the storm inlet at Mississippi Drive and Walnut Street. By 19.2′, two lanes of traffic are covered. At 19.5′ water is across all four lanes of Mississippi Drive at Walnut and all of the riverfront parking lot is underwater. At 19.64′ water is to the center line of Mississippi Drive at Mulberry. At 19.83′ water is on top of the deck at Pearl City Station. At this point, local weather forecasts must be observed closely in order to predict Mad Creek flows. Necessary notifications must be made to the Railroad and businesses utilizing the railroad. Procedures are followed from 20′ and up that include closing structures and the flood gates. Randy Howell, the Street Maintenance Supervisor, makes the call for when flood gates go down. During the next phases, levees are patrolled to watch for boils. Sandbags are added as necessary. Correct emergency maintenance procedures are followed in conjunction with the State of Iowa. This is just a glimpse into what happens when flood levels reach a certain level and how the City of Muscatine responds to flood situations at the riverfront. The City has an extensive plan in place to respond to any flood situation that may arise. Residents and visitors to Muscatine are reminded that if they encounter water over the roadway … turn around and don’t drown. Each year, more deaths occur due to flooding than from any other thunderstorm related hazard. The Centers for Disease Control and Prevention report that over half of all flood-related drownings occur when a vehicle is driven into hazardous flood water. The next highest percentage of flood-related deaths is due to walking into or near flood waters. The recommended flood procedures, as established in 2010, can be found HERE. The current flood prediction hydrograph from the National Weather Service can be found HERE. MUSCATINE, Iowa – A new logo and a new tag line for Muscatine were revealed to the Muscatine City Council on Thursday (July 12), the first of several meetings with community members to showcase the logos’ design and meaning. The culmination of many years of work from leaders of several entities in Muscatine, the logo and tagline are part of a renewed effort to market Muscatine. In fact, the inability to adequately market Muscatine was one of the key reasons that early discussions led to the formation of a leadership committee to study and develop a logo and tagline that would work for the entire community of Muscatine. The committee included members from the City of Muscatine, Greater Muscatine Chamber of Commerce and Industry and the Convention and Visitor’s Bureau, Muscatine Power & Water, Muscatine Community College, Muscatine Community School District, and UnityPoint-Trinity Muscatine. From early on the commitment was to develop a logo and tagline that could be used by all, a commonality that demonstrates the commitment of the community to be the place where living, working, raising a family, and retiring all takes a turn for the better. Working with Northstar Marketing, Inc, out of Nashville, Tenn., the committee coordinated research on the community of Muscatine, on consumer awareness and the perception of Muscatine, and on competition for regional tourism and economic development. Out of this research came a strategic DNA that would form the foundation for development of the logo design and the tagline. Muscatine history was not forgotten in the development of the new logo and tagline, and was fundamental in the development of the DNA statement. The phrases Industrial power along with turning small town ingenuity into unbounded enterprise are another historical reference that also reaches into the future. The lumber industry was the first enterprise that brought recognition to Muscatine in the mid-1860s. H.J. Heinz also brought recognition to Muscatine by building the companies first plant outside of Pittsburgh here in 1892 to take advantage of the fertile soil located in this area. Of course, the early 20th century button industry that led to Muscatine becoming known as the “Pearl Button Capital of the World” was another chapter in the greatness of Muscatine. During the last 100 years companies and corporations established in Muscatine have become recognized worldwide for their products and services and that trend continues today with new businesses and their products becoming recognized throughout the region, nation, and the world. The final part of that DNA does look into the future and notes how Muscatine is the place where you can access the world stage or just watch the world flow by. The rebranding is just one part of a long term commitment by various entities in this community to help Muscatine grow in population, in recreational and employment opportunities, and in housing and educational options. The two-year project to reconstruct Mississippi Drive from Mad Creek to Broadway is part of that commitment by the City of Muscatine to enhance the infrastructure and create a sense of place for residents and visitors alike. The Grandview Avenue project in 2019 and 2020 will add another enhancement as will the proposed 2nd Street revitalization in 2020 or 2021. 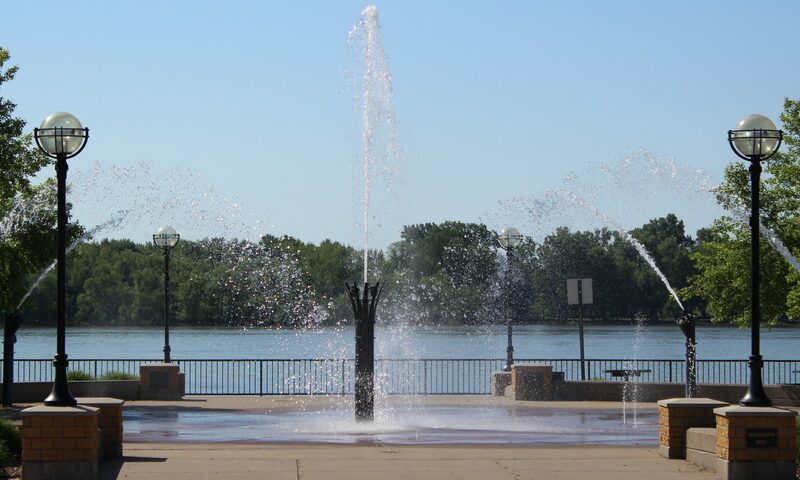 This “turn for the better” will entrust to future generations a connection between the Mississippi River and Downtown Muscatine, an area filled with history and tradition and an area filled with endless possibilities for residents, businesses, and visitors. Those possibilities do not stop at Downtown Muscatine but extend to all corners of the community. When the next phase of Riverside Park improvements is completed, Muscatine will have a recreational and entertainment venue second to none up or down the Mississippi River. When Mississippi Drive is complete, the redefined traffic pattern enhanced for pedestrian traffic, landscaped medians, and wayfinding signs will allow for a greater connection and flow between the riverfront and the downtown area. When the corridor from Mad Creek to the U.S. 61 bypass is complete, Muscatine will have a main artery that will have increased business and residential potential. This is also part of the branding effort. It was mentioned at the City Council presentation on July 12 that the rebranding did not take into consideration the history of Muscatine and that the tagline was vague, confusing, and could be viewed as saying that Muscatine was never great. The opposite is more to the fact. Muscatine was located on the bend of the Mississippi River for many reasons and just one could have been because this is where opportunity takes “a turn for the better”. Throughout the history of Muscatine (and Bloomington before that) this fact was proven. It is being proven today, and will be proven again in the future.